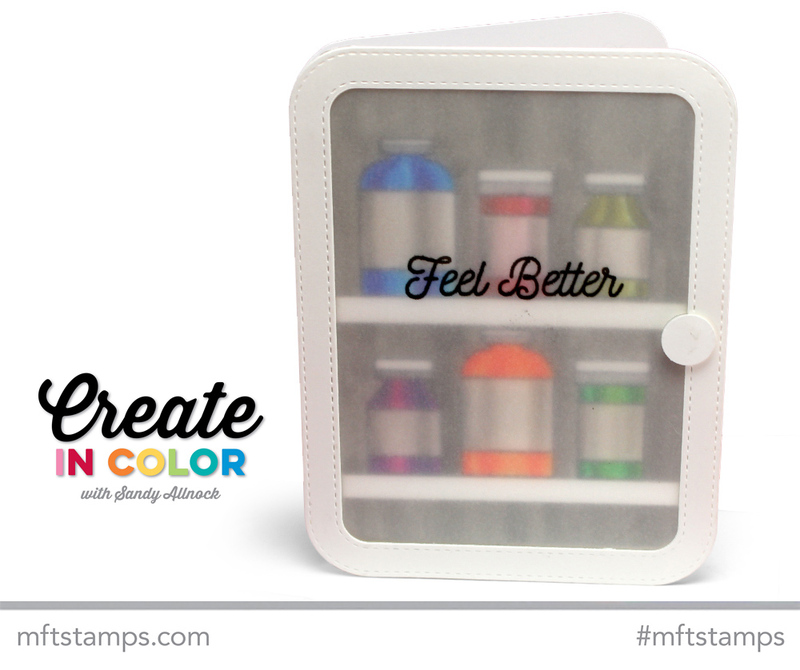 This month’s MFT release has a few of the stamp sets around a theme – get well. (That means it’s time to also consider flu shots, have you gotten yours yet? I just did!) 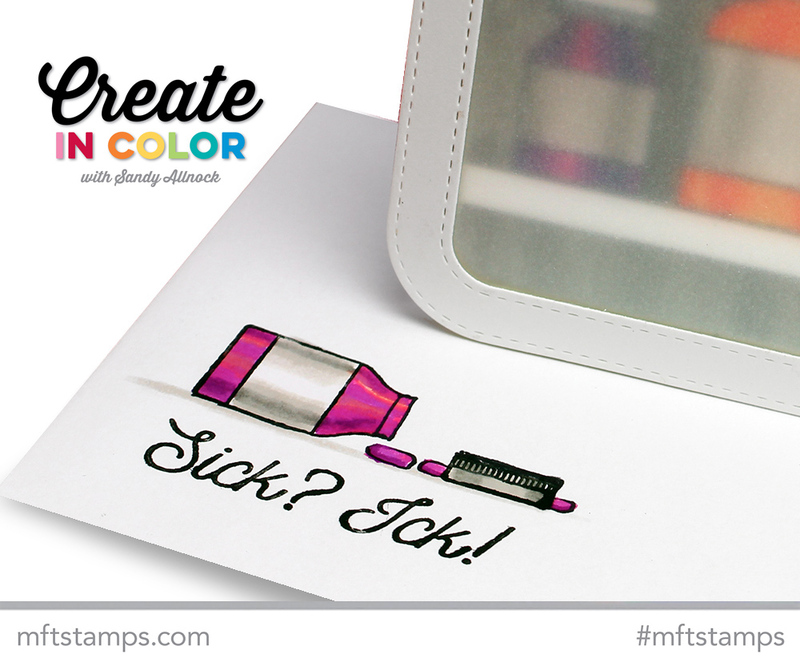 I never seem to have a get well card when I need one…and with me being slow at getting to my “to do list,” having a few special get well cards on hand will be helpful as my friends and family are taken out by a bug! Last month I asked readers to weigh in on which medium to use this month, and Zig Clean Color Markers won out! They have an actual brush for a nib – not the usual foam nibs on other water-based markers. That means they’ve got some special properties, including blending well without water. They also have really strong color! (Bonus Freebie: readable labels for your zigs! They make the text too tiny for my old eyes.) Check out how I colored the bottles and made a darling little medicine cabinet with the Rounded Rectangle Stitched Frame dies! Watch below or click HERE to see it in HD on YouTube. I love to include the decorating of an envelope….The zigs work relatively well on envelope paper. And announcing it’s a happy get well card on the outside? That’s medicine for the soul! Awesome idea. Thanks for young the Zigs, my new fav medium! LOVE THIS!!!! Your ideas are always so great. I love my Zigs and appreciate your tips on getting the highlights. Great card and logo. What about chalk ink? I don’t use mine nearly enough. I have eye shaped pads, pens, and real chalk. I’m not very inspired but I bet you could come up with something fun. Great, creative idea for a card! Receiving this in the mail would make any one feel better! Love the colors on the card. They pop. create in color is awesome. This really is such a sweet card. This is a fantastic get well set. BTW, I love how you did the envelope. I always try to decorate the envelope to match the card. Just makes it more special for the recipient! Love the logo too! Very nice! I love those bright colors essentially when I’m sick , beautiful job !